The screening will take place on Thursday, February 5, 2015, from 9:00-11:30am and the talk will be held from 1:00 to 4:00pm at the Manuel Maldonado Denis Amphitheatre (CRA 108) of the Carmen Rivera de Alvarado Building, School of Social Sciences, UPR-RP. As Haiti still struggles to recover from a disastrous earthquake, it faces an even greater problem, the complete degradation of its natural resources. Fresh water sources are drying up. Flood waters wash fertile soil into the ocean. Natural forests cover less than 2% of its territory. Indiscriminate logging of forests is leading to the desertification of its territory. Overpopulation, unsustainable agriculture and a growing need for lumber and cheap energy sources, mainly charcoal, are main causes for the disappearance of forests and wildlife. A considerable part of its biodiversity is endangered. 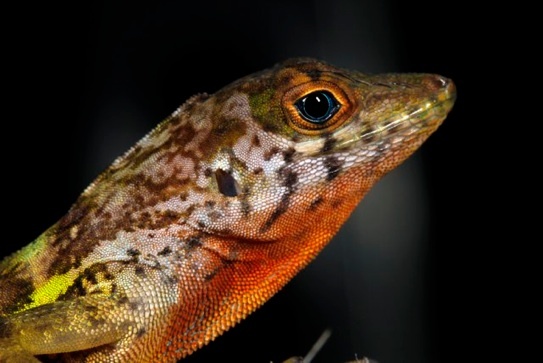 A team of scientists and naturalists, led by Evo­lutionary Biology Professor Dr. Blair Hedges, take on the task to search for species with the help of the Audubon Society Haiti. They travel to the remote regions of La Gonave island and the La Hotte mountain range in order to investigate the current state of Haiti’s biodiversity, and discover almost 50 new species of amphibians and reptiles and rediscover species thought to be lost for decades. A combined effort by Haiti’s govern­ment, the Audubon Society Haiti, Dr. Blair Hedges and the Philadelphia Zoo concluded in the creation of a breeding program of Haiti’s highly endangered amphibians and a cryobanking program at the laboratory of Dr. Blair Hedges. The Caribbean islands have had a political history more complex than any other region in the New World, as revealed in maps spanning five centuries. At the time of European discovery, millions of Native Americans inhabited the islands and they had names for many geographic features. Some of those names are used today, such as Haiti and Jamaica. As islands and regions changed hands, names were introduced in different languages, some new and others as replacements for older names. The names given to islands, cities, and countries sometimes changed repeatedly. For biologists unfamiliar with this complex history, major errors can be made in determining where old but important museum specimens were collected. Timelines of Caribbean toponyms will be discussed, and how they bear on solving some biological questions.